In a letter from the front a German soldier wrote about the attack. In the letter he states that he had thought he was fighting opposite English troops. However, as the British front line was not directly attacked at 5.15pm on 22 April, it can be assumed that the English casualties and captured English artillery he refers to are in fact French. From his description of the “mixture of races” he came across in the Allied lines, it is believed that he may have been in 52. Reserve Division attacking through the boundary of the French territorials of 87th Division and the North African 45th Division. 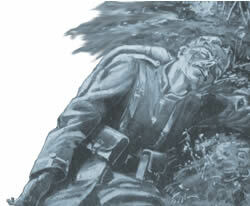 “In a few minutes we were over - we lay down and opened fire... Mines, handbombs and handgrenades flew every which way. We jumped up and in a few steps were in the enemy trench, smashing any attempt at defence that we encountered... We pressed on and on; the first, second and third trench positions were overrun. Now we were in the main position and there were the guns of the artillery! Who would have thought that today we would have captured guns. Nine in total and brand spanking new guns. We had imagined the enemy's opposition to our attack would be very different and we were overjoyed that we were suffering relatively few casualties. Our artillery had done well to soften up the Frenchmen and the English. “... suddenly everyone began to rush forward through the gaps in the wire and swarmed towards the enemy territory as though they were on the parade ground. Over in the enemy lines Frenchmen, Zouaves and Indochinese sat or lay on the ground, coughing and spitting. None had any thoughts of fighting back. For them the war was over... Swathes of the gas cloud, which had gleamed in the sun before us just now, began to swirl upwards, dancing around one another. Then the wind slowly carried the cloud into the enemy positions. Even when it was swirling around it put most of the enemy troops out of action in the front line positions. 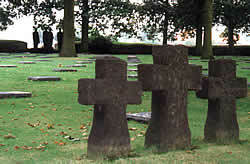 By the end of the war there were several German military cemeteries in the area around Langemarck village. The cemetery that is there today is what is called a “collecting cemetery”, as it has been expanded in size from the original burial ground with graves brought in from the local area and also further afield after the war.